We know you love chicken breast. The challenge is keeping your repertoire for this popular ingredient fresh and exciting. We’ve got you covered with delicious recipes (and helpful tips) that will keep the love alive. 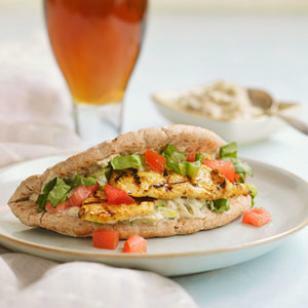 The superheroes in the EatingWell Test Kitchen have developed a recipe for shawarma that features your old friend (and occasional nemesis) chicken breast. The chicken breast carries the flavor of garlic and curry in our Chicken Shawarma (recipe below), done in 4 minutes flat on the grill. Make that for dinner and you will truly have saved the day. Super-Helpful Tip: Slice raw chicken breast crosswise “across the grain” to keep pieces from shrinking as they cook. Besides the shawarma, another way you might not have thought of using chicken breast is to make your own Spicy Popcorn Chicken. The “popcorn” isn’t another movie reference, but a description of the crunchy bite-size nuggets of chicken coated with a nutty crust. So fun to eat! Super-Helpful Tip: When we call for chicken breast in a recipe, we are actually calling for a breast half. Most chicken breasts come packaged together as halves and range in size from 5 ounces to 1 pound each. The usual sort of casserole takes a while to make and bake—so Stovetop Chicken & Broccoli, ready in 40 minutes, is a delightful dinner surprise. Easy, cheesy and comforting…your family’s gonna love this one. Super-Helpful Tip: Use chicken within 2 days of purchasing or freeze it. Store chicken at the bottom of your refrigerator, wrapped in plastic, to prevent the spread of bacteria. I don’t really expect to be able to have Chicken Cacciatore for dinner on a weeknight—some recipes for it can take a lot of prep and cooking time, especially if they call for bone-in chicken thighs. But the delicate flavor of chicken breast is emboldened by mushrooms and herbs in this Quick Chicken Cacciatore recipe—and it’s ready in under an hour. Super-Helpful Tip: If you can’t find small chicken breasts, cut 8-ounce breasts in half “on the bias” to get two similar-size portions that will cook at about the same rate.